Want a wood finish with lots of charm and not too much prep work? Gel stain has you covered. When it’s time to finish a wood-based project, your options tend to seem at one end of the spectrum or the other: choosing between a traditional varnish or stain that leaves the character-building front and center and a more complete coverage from their paint color of choice. What many do-it-your-selfers—particularly beginners—don’t realize is that a happy medium called gel stain exists, and it requires even less preparation. Popular manufacturers of gel stain include Minwax (view on Amazon) and Old Masters (view on Amazon). Stocked alongside its classic counterparts at almost any hardware store, gel stain is rather similar in formula to most pigment-based traditional stains. A thickening agent added in the manufacturing process, however, gives it the easy application and concentration of color. The resulting finish achieves a compromise between a transparent stain and an opaque paint, which to some DIY enthusiasts means the best of both worlds without as much hassle. If you’re weighing your options for what to do with the bare-wood build or a recently stripped wooden table, consider this finish. We’ve laid out its biggest benefits and best uses as well as the drawbacks to help you decide. Looking for color and depth without covering up all the grain and character that make wood uniquely attractive? Gel stains offers a great option for DIYers who can’t quite decide between staining and painting, since it offers something in between. The primary difference between gel and a traditional stain is that gel stain sits on top of the wood while a traditional stain sinks in; as a result, it lets some of the wood’s unique markings and texture shine through while delivering a crisp, consistent finish not dissimilar to paint. Gel stain is particularly forgiving with splotch-prone woods like birch, cherry, maple, and pine. These varieties tend to absorb thin traditional stains unevenly, looking messy and unfinished no matter the number of thin coats, but accept gel stains easily. 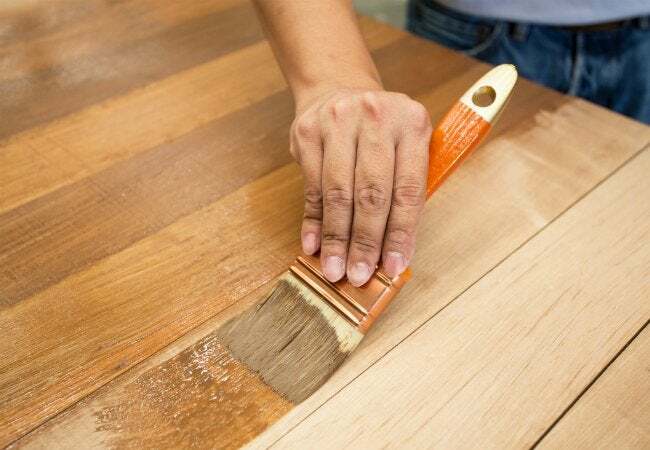 By coating the surface rather than seeping into the wood grain, a gel stain creates a professional-looking finish on even these most stubborn wood surfaces. But the good news doesn’t stop there—arguably, the best reason to choose gel stain is its ease of use. When it comes to application, gel stain requires less preparation in advance than regular stains and paints. It doesn’t require you to sand the wood all the way down to its raw state for best adhesion the way you would with a typical stain. In fact, just a little light sanding will do the trick, and then you’re ready to begin the application process with a lint-free cloth. Alternatively, you can use a natural bristle paintbrush if you want a more textured, painterly finish; just be sure to choose a size relative to the project you’re working on (three-inch-wide for a broad surface, but smaller for chair legs) and paint with the grain to mimic its general pattern. Another perk, still, is gel stain’s ease of use in vertical projects. 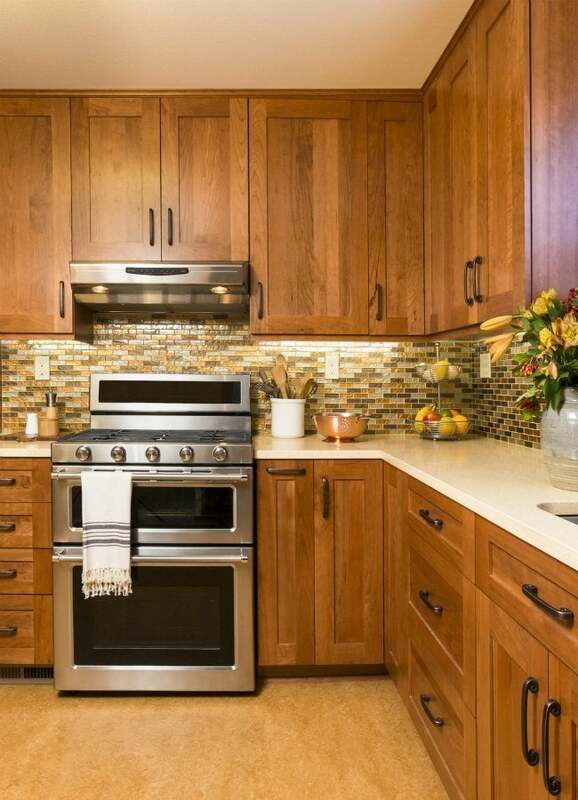 Pre-installed cabinets will suffer fewer drips, drops, and messes when you’re working with the peanut-buttery consistency of gel stain, as opposed to the thin liquid you’d be dealing with otherwise. Of course, no stain is perfect. One area in which gel stain is tied neck and neck with its traditional counterparts its drying time: although it’s easier to prep and apply, it doesn’t dry any quicker than its thinner, oil- and varnish-based competitors. Much like other stains, it typically needs anywhere from 8 to 24 hours to dry between coats—of which you might need several, depending on the level of opacity you want to achieve. Always refer to the instructions given by your stain’s manufacturer, and be sure to take humidity and temperature levels into account since extreme heat, cold, or moisture can lengthen the time it takes any stain (or paint, for that matter) to dry. The main drawback of gel stain is the fact that it can end up looking uneven on projects with lots of deep crevices and corners, where it’s tough to get coverage in a single swipe. If you’re working with a particularly gnarly piece of live-edge wood or an intricate set of custom shelves with lots of extreme angles, for example, a traditional stain might be the wiser option. That’s because in spots like these, gel stain can accumulate and appear much darker than it does across the rest of the surface you’re covering, leaving you with less-than-perfect results. Generally speaking, you can use a cloth rag to wipe away wet gel stain and fine-tune the finish as you go, but it might be touch and go in tough-to-reach spots like deep cracks and extreme corners. Having earned its user-friendly reputation, gel stain is quite the attractive option for whatever wooden DIY project you’ve got lined up, promising a rich color without sacrificing the unique character of its grain. Apply its thick consistency to horizontal tabletops or vertical cabinet framework, fine woods or those notoriously difficult to cover evenly. When you’re ready to get started, pick up with Step 1 of this helpful tutorial for staining wood. You’ll see for yourself how gel stain combines the uniformity of paint and the depth options of stain—all in one small can.